Reprinted from The Outer Banks Voice. If you were asked “what is your favorite bird,” what would be your answer, and why? Would it be a common bird, like a blue jay or a rare bird, like an ash-throated flycatcher? Would it be a large, fierce species, like a bald eagle, or a diminutive one, like a nuthatch? Maybe a backyard feeder-bird with a great “personality,” like a Carolina chickadee? You can feed chickadees from the palm of your hand if you really try. How about a really colorful bird, like a painted bunting? I’ll bet that one hits a lot of top 10 lists. You may be into owls – snowy owl is not a bad favorite – beautiful, graceful and dangerous. Hummingbirds are a favorite of many people. I know people out west that devote their whole lives to hummingbirds. How about a bird you’ve never seen – impossible? I’ll bet a lot of people would pick penguin as their favorite. I have a friend whose favorite bird is a turkey vulture. While “buzzards” have a face only a mother could love, they are actually very fascinating and graceful creatures. Personally, I don’t have a favorite. When asked, I’ll usually respond with “my next lifer is my favorite” because I love to see new species. There are many reasons to like birds: their beauty, grace, speed, behavior, personality, song and of course, they can fly. Well, most of them. Those that can’t are usually very fast runners, or really great swimmers, like the penguin. April presents us with a whole plethora of newly arrived songbirds to choose from. Dazzling warblers in their bright breeding colors: yellows, greens, blues and oranges, with bold stripes, bars, spots, lines – each species unique and beautiful. Vireos, painted in various shades of green, yellow, blue and white are a little more subdued but still handsome. Swallows, quick on the wing and good looking, too. The sassy little blue-gray gnatcatcher, with a long gray and white tail. Shy thrushes, known for their unbelievable songs, begin to arrive by mid-month and continue into May. Other migrant songbirds arriving include: orchard oriole, indigo bunting, eastern kingbird, great-crested flycatcher, chimney swift, summer tanager, chuck-will’s-widow and of course, our beloved ruby-throated hummingbird. Primarily Central and South America. It was a long-distance flight, with no control tower, no spelled-out flight plan, no guarantee of good weather and no calendar, and yet many (most?) of these birds arrive at the right location (habitat) at the right time, often on the very same day as the year before. 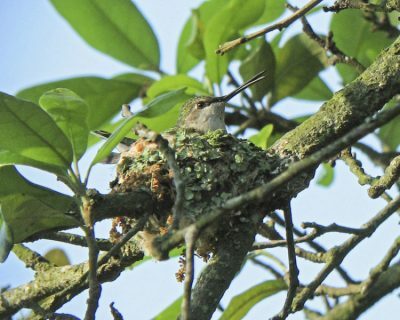 Let us explore the life history of one of our most cherished yard birds – the ruby-throated hummingbird – a real favorite with a lot of people. What’s not to like? They’re beautiful, feisty, tiny and easy to attract to your yard. And they are masters of flight. They can fly up and down and sideways and backward and can stop on a dime. As small as a ruby-throat is, at just over 3.5 inches long (including the bill) and weighing in at only 0.12 ounces, they still have to make an incredibly long flight each spring from Mexico and Central America, some as close as Florida and others as far away as Panama, to their breeding grounds in the U.S. and Canada. When a female arrives about a week later, courtship begins, with the male making looping, U-shaped, high-speed dives from 40 to 50 high to attract her attention. His wings during these flights, produce a loud buzzing sound and he often chatters as well. As soon as she accepts his advances and mating is over, the male and female have little to do with one another. The female begins the nest building and the male looks for more females. The nest is a tiny, cup-shaped home, no more than about an inch deep and a couple of inches across. It is constructed of soft plant materials and held together by spider web silk and camouflaged with bits of moss and lichen. The nests are built far out on a downward sloping or horizontal tree limb, often in a small crotch. On the Outer Banks, I’ve seen several nests in live oaks, a few in dogwoods, one in a maple and one in a loblolly pine. The ones I’ve seen have been from about 8 feet high to around 25 feet high, although they can be higher. The best way to find a nest is to sit quietly and watch to see which direction the female flies. Eventually, with a little luck, she will lead you to the nest. She lays two tiny, white eggs about the size of Tic-Tacs. The eggs are incubated for about two weeks. The female then does all the feeding while still protecting her young. The male does not help at all. It takes about three weeks for the nestlings to fledge and when they do, they are full grown and can forage on their own. Ruby-throats often produce two broods in this area and I actually had a nest in my yard once with eggs in August. Ruby-throats prefer wooded areas with open areas for feeding; a backyard with lots of flowers is perfect. 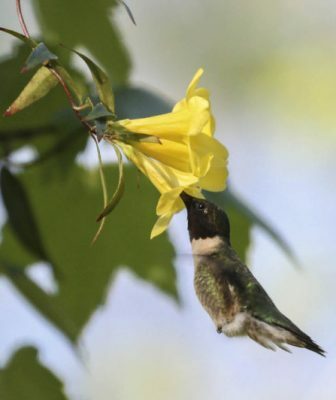 Hummingbirds prefer tubular flowers such as cardinal flower, coral honeysuckle, trumpet creeper, red buckeye and bee balm. Flowers do not have to be red, but hummingbirds are attracted to the color. Nectar feeders work well but must be kept clean and filled with the correct solution of sugar water. To make the solution, heat up one cup of water to boiling and add one-quarter cup of plain, white sugar – use nothing else. Red dye is unnecessary and may actually harm the birds. The nectar found at box stores is a huge waste of money. All you need is plain, white sugar and water. Feeders need to be cleaned twice a week. Do not use soap. I prefer the small, saucer-style feeders for their ease of cleaning. 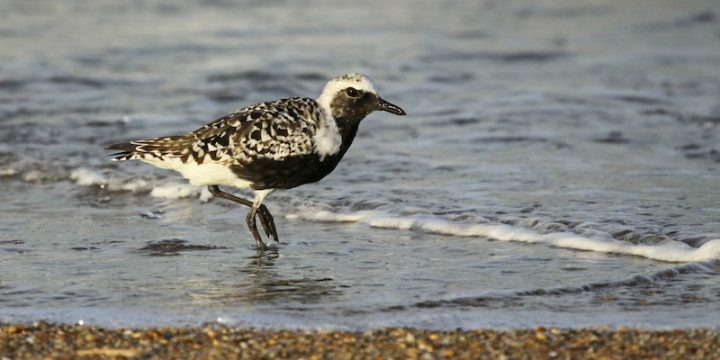 In addition to ruby-throated hummingbirds and all the other fabulous songbirds, April is a great month for shorebirds. Most are in full breeding plumage and are gorgeous. So get out there and find your next favorite bird! This story is provided courtesy of the Outer Banks Voice, a digital newspaper covering the Outer Banks. 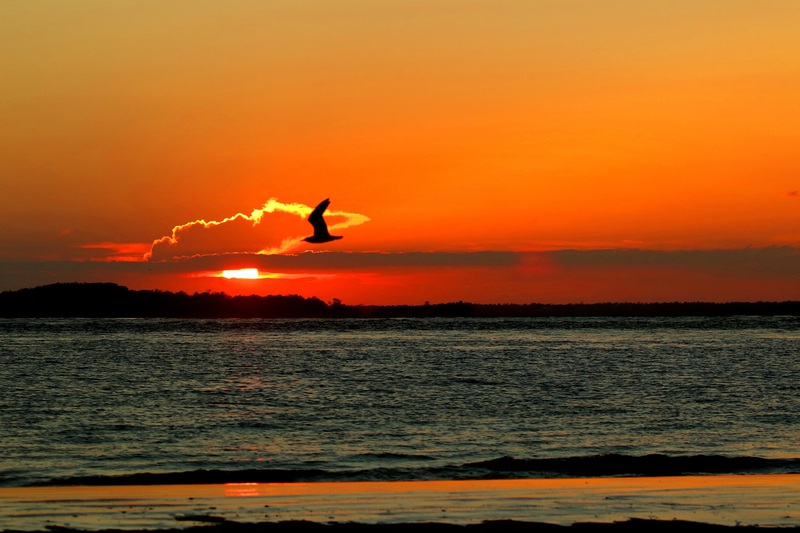 Coastal Review Online is partnering with the Voice to provide readers with more environmental and lifestyle stories of interest about our coast. 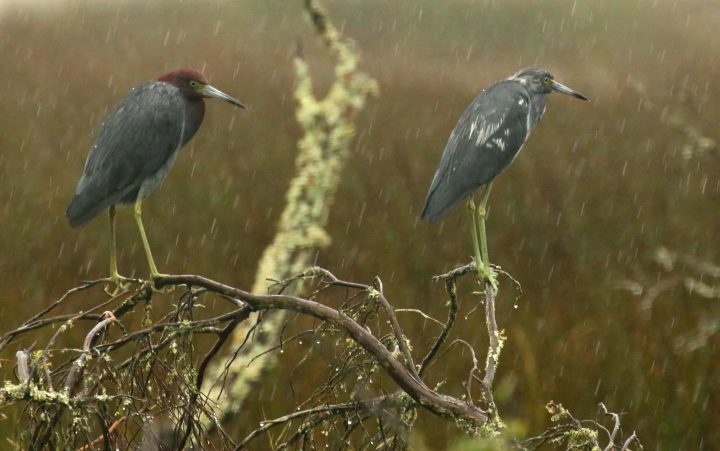 long-time resident of the Outer Banks, Jeff Lewis is the horticulturist at UNC's Coastal Studies Institute, a wildlife photographer and an all-around naturalist, with a special interest in birds. Jeff’s photography has been displayed in many galleries and museums, has been used for educational signage and kiosks and has been published in numerous books, magazines and newspapers.